Is your club an ANA member? Tap into these great benefits. Click on the slideshow to begin benefits presentation. ANA Club Membership connects you with more than 500 other coin clubs around the world. Your club gets the support it needs to advance the hobby, promote education and further explore the world of money. Starting a new club? Email clubrep@money.org for more information on starting an ANA member club. "Whether you'd like to upgrade the condition of your coin club from Fine to Extra Fine or form a new club", this free eBook written by Bill Fivaz will help you achieve your goal! Scroll down for a list of club benefits. ANA clubs are encouraged to list their club information in our online directory to connect with the general public and other hobbyists interested in discovering and exploring the world of money. This platform is an excellent marketing tool for ANA club recruitment efforts.The club information will be posted on the ANA website and provided to the public as requested at no charge. ANA can provide promotional membership materials for club coin shows at no charge to ANA member clubs. Requests for coin show kits should be received by our membership department at least 30 days in advance of show dates to guarantee arrival before the coin show opens. ANA will reimburse expenses incurred by ANA clubs in encouraging ANA and club membership growth in the amount of $25 for each ANA club per fiscal year. Reimbursement will only be paid for advertisements soliciting new members. The ad must include the name of the ANA club and the time and place of meetings. Advertisement for local coin shows are not covered under this program. ANA will provide certificates of recognition to educational speakers that present to ANA Clubs. We encourage District and Club Representatives to communicate the availability of this special recognition for their educational speakers. Please fill out and submit the Club Speaker Certificate of Appreciation Request Form to the Membership Department, at least 30 days in advance of the award presentation in order to guarantee the arrival date. ANA Clubs are encouraged to submit their regularly issued club publications for entry into the annual Outstanding Club Publications Contest. Publications must have been issued on a regular basis monthly, quarterly or otherwise. The competition is divided into four categories: specialty club, regional club, local club and electronic. First place winners will receive a plaque, second and third place winners receive a certificate.The awards are presented at the annual ANAWorld's Fair of Money®. ANA offers substantial discount for ANA clubs to participate and enjoy the Numismatic Diploma Program. Receive a well-rounded education in numismatics - get the basics and much more in a structured and exciting series of courses and examinations. Published on the Money.org Events Calendar and monthly in The Numismatist magazine, this is a free service reserved for ANA member clubs. Entries must be received at least eight weeks prior to the desired cover date of the magazine, and preferably as much as four months in advance so announcements can appear in several issues. Clubs may borrow books, auction catalogs, and slide and video presentations through the mail. The books and catalogs are loaned for a period of six weeks. This is a great educational resource for club meetings. For single events or annual coverage for meetings and shows, liability insurance is available through HughWood Inc., www.hwint.com/usa/hughwood/ana. For further information, call 1-888-277-6494 or e-mail insurance@money.org. 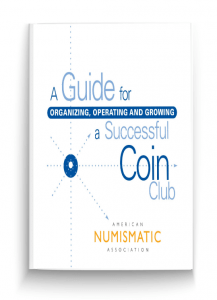 ANA will assist you in mailing invitations to your Club Coin Shows or Club Meetings at minimal cost. For more information or questions, contact membership@money.org. Borrow an ANA Traveling Exhibit for your next show or community event. For more information or questions, contact museum@money.org. As space is available at conventions, the ANA can offer table space in the Club area for the no charge and use of a meeting room for free for two-hours at no charge as meeting space allows. For more information or questions, contact convention@money.org. ANA makes available online downloadable information and ideas for special emphasis during National Coin Week, held the third week in April each year. For more information or questions, contact ncw@money.org.